Korean Air is set to increase capacity of its flights between Seoul Incheon and Bangkok later this month, with Korean Air forecasting a healthy seat load of 90 per cent during the busy winter season. From December 19, 2015 to March 2, 2016, the Skyteam member will add a fourth daily service between the two cities, which it will serve with an A380. 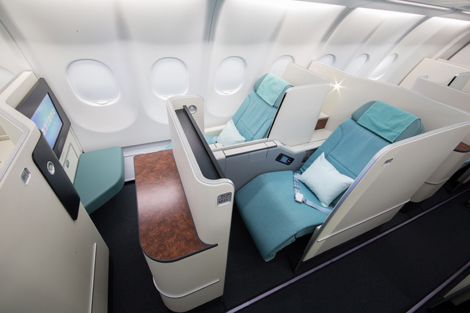 Korean Air outfits its superjumbo with a three-class configuration, which includes 12 suites in first, 94 seats in Prestige (business) and 301 in economy. The high seat count in business can be attributed to the 2-2-2 seating arrangement. However, despite the six-across configuration, the Prestige Suite has been arranged in a way where every passenger still enjoys direct aisle access. The deployment of the A380 makes Korean Air the second South Korea-based carrier (after Asiana) to fly the superjumbo on the Seoul–Bangkok route. Emirates, Thai Airways and Qatar Airways also operate A380 services through Bangkok’s Suvarnabhumi Airport.